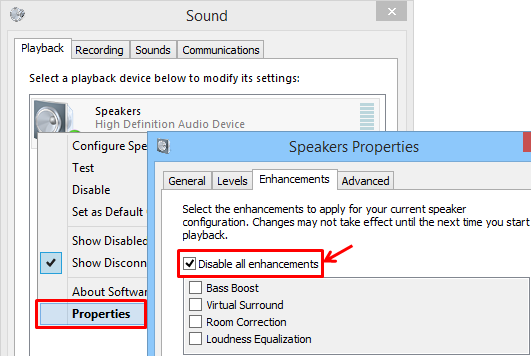 If the audio makes a quick chirp at the beginning of the video, it might be a problem with the codec or your media player. 1. Download the latest version from https://www.bandicam.com/downloads/, and try the .mp4 container. 2. Try VLC Media Player or POT Media Player. 3. Uninstall codec packs on your PC. 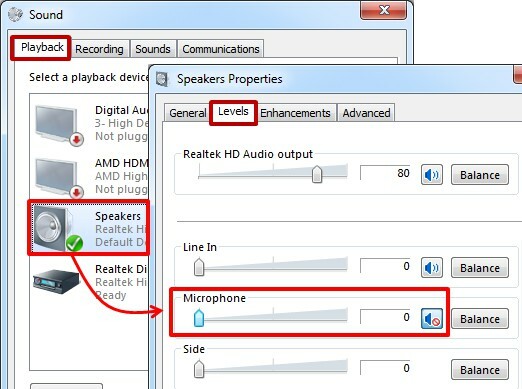 CASE 2: How to remove "microphone howling/robot/echo sound"
If you use the "Two Sound Mixing" option in Windows Vista/7/8/10, go to the "Playback" tab, double-click "Speakers," click the Levels tab, and then mute the microphone volume. 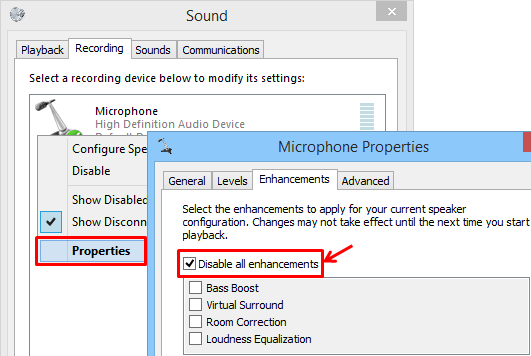 If you use the "Two Sound Mixing" option in Windows Vista/7/8/10, go to the Recording tab, double-click "Microphone," click the Levels tab, and then uncheck "Listen to this device." 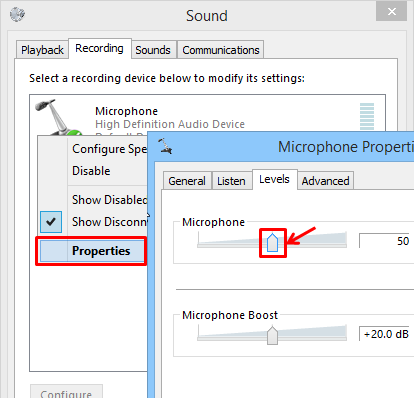 If you use the "Two Sound Mixing" option in Windows XP, go to the Volume control window, choose "Recording", and then reduce the microphone volume by 50%. 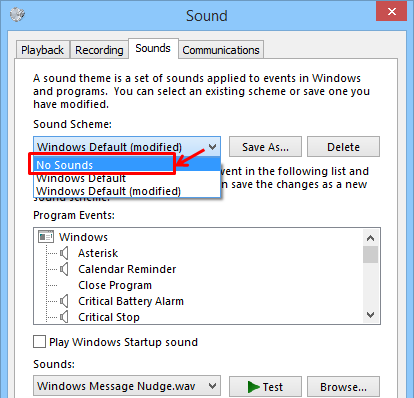 To remove the mouse click sound while recording, select "No Sounds" under the Sounds tab of Windows. 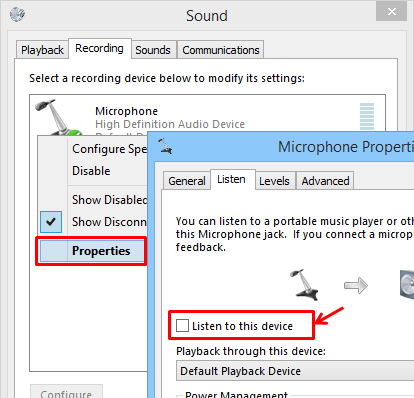 If you still have the problem, please try "Windows Sound Recorder" (or "Windows Voice Recorder"). 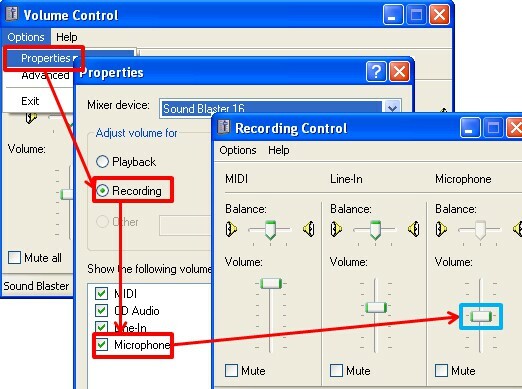 If you have the same problem with Windows Sound Recorder, it is not a problem of recording software.